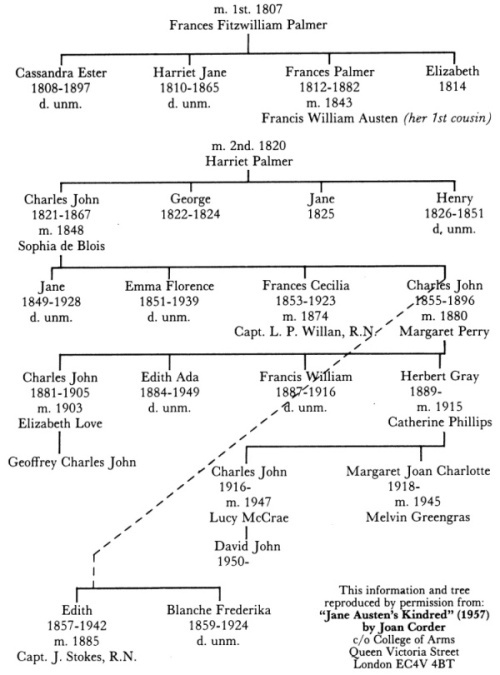 Charles John Austen was the last child born to the Austens, in 1779, when Jane was three years old. They must have enjoyed a close relationship considering that, aside from the one or two years that she spent “away” at school, they lived together until she was 15 and he, 12. Even then, he was only as far away as the Royal Naval Academy in Portsmouth from 1791 to 1794. If tangible proof of their closeness is necessary, more tangible than the assumption that the character of William Price is based on Charles, it can be found in Charles’s journals and diaries (1815-1852) which are presently on loan to the National Maritime Museum in Greenwich, England. A day there is scarcely enough – there are 63 diaries! Log books, letter books and miscellaneous records kept by Admiral Sir Francis Austen (1774-1865) may also be perused, but this writer could find no mention of Jane Austen in the half dozen volumes he scanned. The complete story of the admirals can be found in Jane Austen’s Sailor Brothers, by J. H. and E. B. Hubback (London: The Bodley Head, 1906). Not so complete, however, in the case of Charles. The Hubbacks may have stinted in their treatment of him since he had committed what the Victorians deemed a heinous crime: marriage to deceased wife’s sister. 14 June: Jane continuing very ill.
arrived at dinner time & found my mother very poorly. saw her twice & in the evening for the last time in this world as I greatly fear. 24 July: A very fine day. Dr Jane’s funeral. Charles visited Chawton in July of 1820. He mentions driving Cassandra in a donkey cart (Jane’s) to Alton and visiting Selborne with her and Mrs. Digweed. 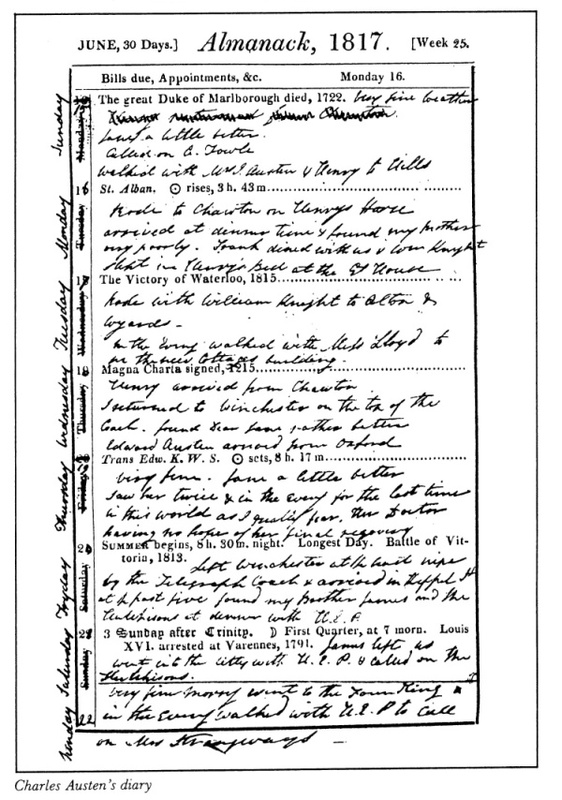 Cassandra’s death on March 22 is recorded in the diary for 1845. This information was gleaned from a cursory inspection of two-and-a-half feet worth of volumes. More awaits closer scrutiny, but it is evident in this brief sampling that Charles was not only devoted to his Dear Jane but to all the other members of his family as well. The books are peppered with mentions of Frank and James and here is what he has to say on the occasion of Henry’s birthday, 1816. 7 June: This is poor Henry’s birthday The most unhappy to him probably of any of the 45 he has passed why should I word the sad reflections the anniversary has filled my mind with. Charles died while on duty in Burma in 1852. It is of interest that although Charles’s son, Charles John, became a naval officer, he died young and the family fell on evil times. His son Charles John became a telegraphist, and his son, Charles John drove a bread van, while his brother, Francis William was a grocer’s assistant. Some of Admiral Charles Austen’s descendents live in North America.